Kathy White: The Buzzard Tree, Solo Exhibitions, and a New Workshop. Oh My! The Buzzard Tree, Solo Exhibitions, and a New Workshop. Oh My! 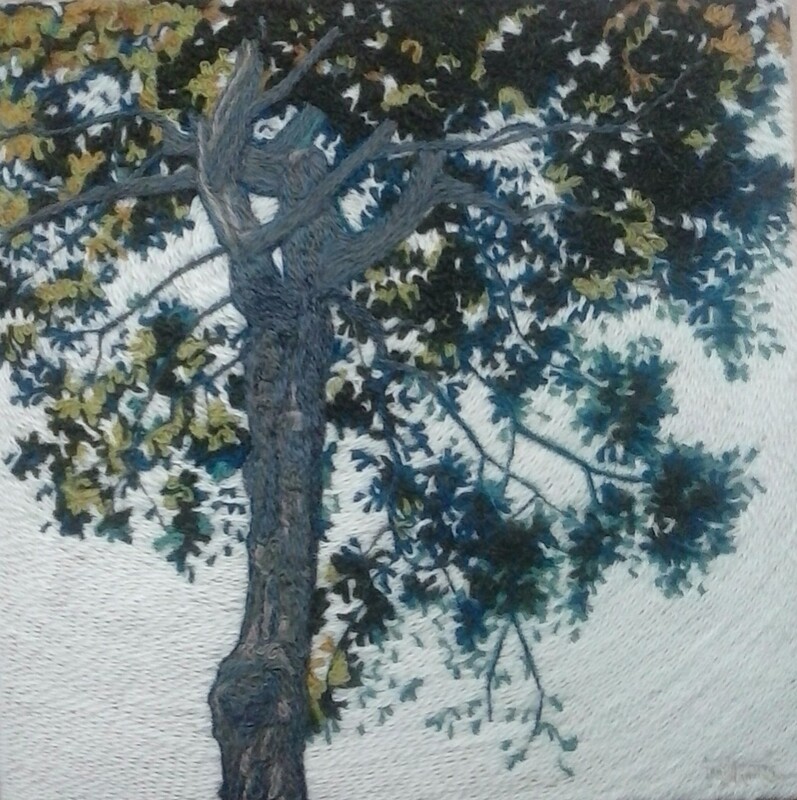 The Buzzard Tree, Peruvian Wool and Beeswax on Birch Panel, 12" x 12" x 1.5"
Few words are as fun to say as 'buzzard'. Especially if you give it a nice rural twang - buhzerd. 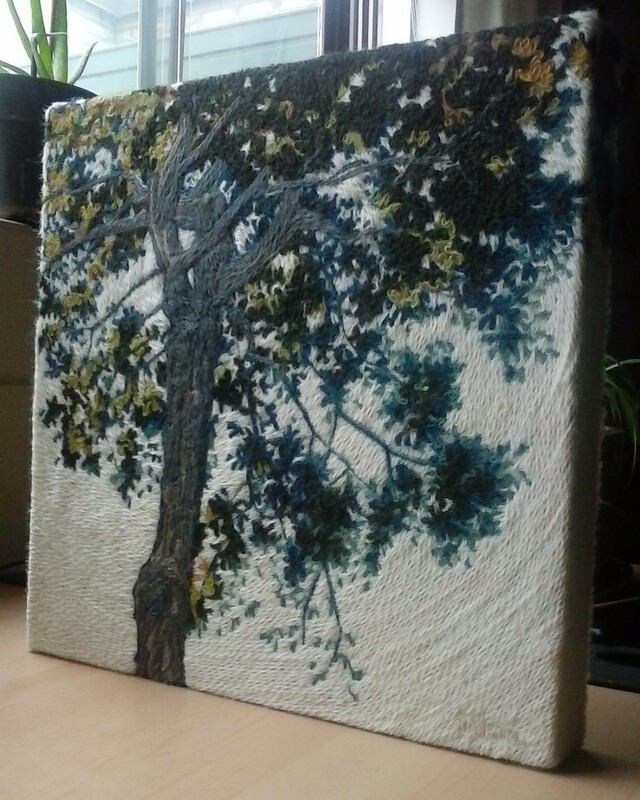 The third square foot piece in my Harrison Park series is finished and is named 'The Buzzard Tree.' Why? Because there are buzzards in the tree. You just can't see them. Detail of The Buzzard Tree - White in white on white. Playing with texture. One morning while camping, I crawled out of our tent and looked up to see the sky dark with large, ominous looking...um...vultures? Buzzards? They wheeled slowly overhead for half an hour and then they all settled silently into the branches of this tree. The Buzzard Tree. I grabbed my phone and tiptoed under the tree to take some shots but when we got home I discovered that, although I had lots of shots of the tree, I didn't get a single image of a bird. Creepy! So, as I say, the buzzards are there. You just can't see them. Weird. The Buzzard Tree - but where are the buzzards? The Harrison Park series is progressing (almost) on schedule and now, the next phase of the plan has started to take shape. I have been selected to mount a solo exhibition of my work in the Rotunda Gallery of Kitchener City Hall in August 2017. This is really exciting and exactly what I was hoping for. The Rotunda Gallery was one of my favourite haunts when I lived in downtown Kitchener. I have also been shortlisted for a solo exhibition in the Blyth Festival Art Gallery next year and hope to hear the results soon. On October 5, I am giving an artist talk to the very talented members of the Kitchener-Waterloo Weavers' and Spinners' Guild and, also, there's a new workshop coming up. See the flyer below for details. Mmmm...cozy wool and gourmet roasted coffee in November. I can't wait. 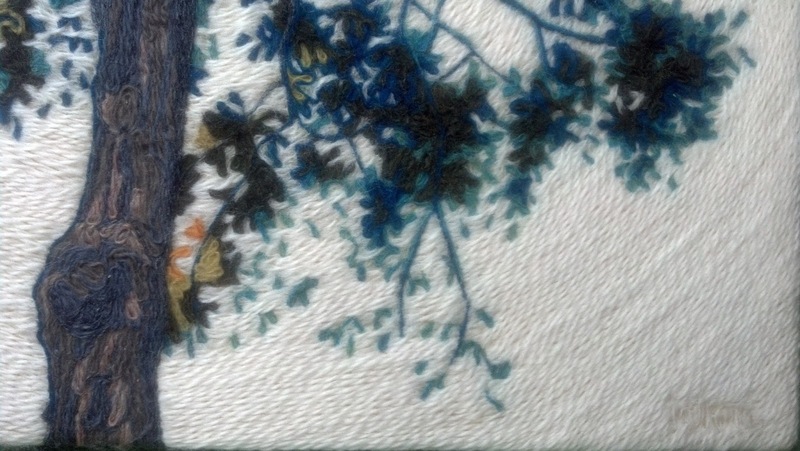 Take adult colouring to a new level with fibre art yarn painting. Join local fibre artist, Kathy White, for this fun workshop that is part art therapy, part colour theory and entirely creative expression. Participants are provided with everything they need to design and take home their own unique 5 x 7 yarn painting using wool yarn and fragrant beeswax. Kathy discusses techniques for applying the yarn to beeswaxed panels to create different effects. Participants will have a choice of colours and techniques to make their work truly one of a kind. Visit www.kathywhiteart.com to learn more about Kathy’s work.